As we plan for the next growing season, we’re keeping in mind our intention to simplify. It’ll be our seventh season, and we’re now turning our attention towards refining rather than expanding. Our new mantra: Grow less, and grow it well. 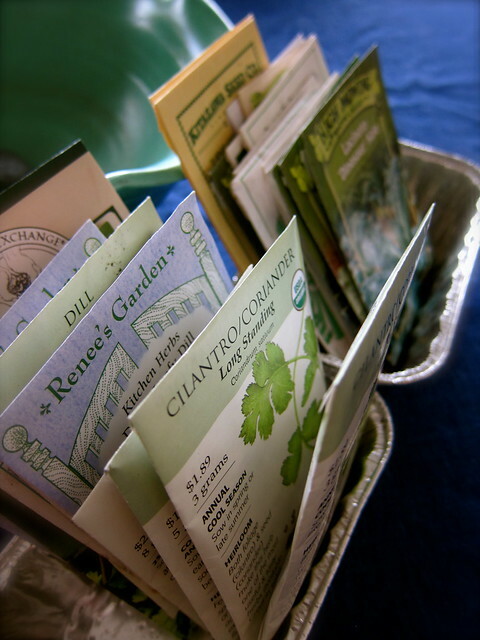 It’s easy to get carried away by glossy seed catalogs that arrive at a time when we’re most susceptible, but paring down the planting list does have its benefits: a more manageable garden, less chance for loss and waste, increased space for rotating the beds, and allowing the soil to rest between plantings. Using trial and error as a guide, we try to select what works best with our garden’s micro-climate, which consists of a long and cold spring followed by a short burst of summer warmth, then a prolonged and temperate fall ending with the first hard frost. We start seeds around mid-March, a later schedule than others, then hold them back while we patiently wait for the ground to warm up and the last frost to pass. Once things are in the ground, we can expect some extra growing time in fall that helps to make up for the late start. Even so, there are some vegetables and varieties that simply require a longer season than we have. We try to choose things that work within these constraints, such as smaller sized tomatoes, eggplants, and winter squash, and depend on our local farmers’ markets to fill in the rest. Of the vegetables we dropped last season — beets, parsnips, eggplant, and salad turnips — it was also a question of space and timing. We did miss having our own eggplants, though, and it’s very brief shelf life makes it a compelling vegetable to return to the list. Other ways of coping with with our garden’s particular needs is through buying seed from regional sources, and by saving our own from plants as they adapt. So far, we’ve been able to save seed from shell peas, filet green beans, 3 varieties of garlic, and 2 varieties of winter tomatoes. Still, like most gardeners, we can’t resist something new and we’re adding potato onions as this season’s challenge. Rossa Lunga di Tropea (F); planted too late last season to fully develop, try a second time. Add Potato Onions (F); plant in fall, possibly with garlic. Perennial plantings of chives, garlic chives, and Egyptian Walking Onions. Some success with ramps; left as is to further establish. Narrowed last year’s list of 4 varieties to 2 — Arugula OG (F) for main season planting, and Ice-bred OG (F) for early spring and late fall/winter extension. Purple Passion continues to out-produce Jersey Supreme; work on soil fertility and bed maintenance. Masai filet green bean (saved seed); Cascine (SI), Aguadulce (SI), and Superaguadulce favas (SI); Green Arrow OG (F) and Coral (F, co-op members) shell peas. The 3 favas mature at different rates, Cascine seems to do best here and has longest season. Season too short for successive plantings of peas, plant all at one time this spring. Spring planting of Spring Raab (HM) and Fun Jen (F). Fall planting of Cima di Rapa Quarantina (SI), Hon Tsai Tai (HM), Italiko Rosso Chicory (F), Tatsoi OG (F), Puntarelle Stretta (SI), Catalogna Brindisi (SI). Selection depends on what else is growing at the time and how they’ll be cooked; refine list as we replace seed. Napoli (HM) for spring and fall/winter extension. Of all the carrots we’ve tried, this one seems to do the best for us; stores well. Brilliant (F); smaller than usual heads last season, purchased new seed. Rainbow (HM) for entire season; Fordhook Giant (HM) for fall/winter extension. Boothby’s Blonde OG (F) for slicing; National Pickling or other purchased seedling for preserving. Purchase seedlings for Fairy Tale or other small Asian variety. Pingtung Long (F), first time growing from seed, as back-up. Finale (HM) and Orion (HM), chosen for flavor and bolt-resistance. Phillips (F), Music (F), and Rossa di Sulmona (SI); all from saved seed. Siberian (HM) and Red Russian (HM) for entire season; Lacinato (HM) for fall/season extension. Siegfried (F, co-op members) and Bandit (HM); plant only for winter/season extension as don’t cook with during early fall; overwinters left in-ground. Shishito Pepper (HM); vigorous producer, reduce to two plants. Peppers turn red as they mature, may be dried. Yukon Gold (F); continue growing in containers. May change to Keuka Gold depending on this season’s outcome. For spring/summer: Valentine’s Day Mix (HM), French Breakfast (HM), Cherry Belle (HM), and Cincinnati Market (SS). For fall/winter storage: Japanese Long Scarlet (K), Miyashige White Daikon (HM), Watermelon (HM) and Green Meat (F). Refine list as we need to replace seed. Chipman’s Canada Red and MacDonald; need to divide. For spring/summer: Gourmet Lettuce (HM), Gourmet Baby (BI), Farmer’s Market Blend (BI), Red Planet (HM), Misticanza di Lattughe SI). For fall/season extension: Winter Lettuce Mix (F) and Misticanza di Lattughe Autunno-Inverno (SI). Continue second season with Agretti (SI); seed heavily then thin. Italian White and Sunrise Lemon (HM). Costata Romanesca Zucchini OG (F) and Zephyr (F) for summer; Zeppelin Delicata OG (F) and possibly Spaghetti Squash (HM) for winter; Tromboncino Summer Squash (F) as dual purpose summer and winter. We’ve still 4 Tromboncinos, well suited to winter storage. Sun Gold and one other cherry (purchased seedlings). Continue Aprile and John Forti’s Piennolo from our seed saved from last season. Drop Ponderosa, season too short to reach maturity before harvest, and prefer flavor of red varieties of these winter tomatoes. This entry was posted in garden and tagged seed notes. Bookmark the permalink. I’m really impressed with how well you document everything. I tend to have good intentions, and poor follow-though on that sort of thing. Ask me what variety of garlic I planted this year, and I’ll admit that I lost the labels. Sigh….. The gardener keeps an ongoing spreadsheet and, with a year-long cycle, it’s the only way to remember what we did from year to year! I am trying to work harder to sow things that grow well here, too. I am trying to save my seeds, but I still purchased quite a lot this year. I am hoping to turn to more of my own seeds in the future. Good luck and God bless on your garden. Saving seed has a rhythm of its own — it requires that you let the plants go long enough to flower, then set seed, which can be a challenge when space is at a premium!